Developers only earn LEED credits for using sustainably harvested wood if it meets or beats FSC standards. Big timber companies, partly shut out of the green building market, have lobbied the Green Building Council — in vain — to accept SFI certification. Turning up the political heat, timber companies have prodded Congress and some states to dump the use of LEED rating systems altogether for government buildings. Many academics and government foresters are avoiding the fight, arguing that both certification systems improve forest practices and can reasonably claim to promote forest sustainability. But the two camps have decidedly different notions of forest sustainability. The FSC, as it applies in Oregon, generally restricts clear-cuts to 6 acres, says Mike Cloughesy, forestry director for the Oregon Forest Resources Institute, a Portland agency created by the Legislature that’s funded by the timber industry and designed to nurture it. SFI allows clear-cuts that can average up to 120 acres — which can mean one clear-cut of 2 acres plus another of 238 acres — says Ryan Temple, president of Sustainable Northwest Wood, a Southeast Portland lumber yard that only sells wood that meets or exceeds FSC standards. Cloughesy points out that clear-cuts larger than 120 acres are not allowed in Oregon under the state's forest practices rules, though larger clear-cuts are allowed in SFI-certified forests in Washington and some other states. FSC bans persistent and hazardous pesticides and herbicides, Temple says, while some are permitted under SFI. Atrazine, an herbicide banned in Europe and by the FSC, is sprayed by helicopter in Oregon forests certified under SFI, he says. SFI also undergoes periodic reviews of its standards, and will come out with revisions in 2015, Luoto says. Temple says the SFI label and its lower standards creates “market confusion” for consumers, but he doesn’t view it as greenwashing. “It’s more the notion of ‘we’ll replant; we want to make sure that there’s always trees there,’ ” he says. There’s no need to scrutinize the fine print to assure you’re buying sustainably cut timber at the inner Southeast Portland lumber yard run by Ryan Temple. Every piece sold at Sustainable Northwest Wood must meet or exceed the standards set by the Forest Stewardship Council (FSC), the world’s most respected “green seal” for wood products. Half the wood comes from Oregon, and Temple enjoys telling personal stories about the origin of his inventory, much as restaurateurs do when serving local meat and produce. Shoppers at the 7,500-square-foot lumber yard a few blocks south of OMSI might find cedar cut from a Girl Scout property in Stevenson, Wash., a Nature Conservancy site in Willapa Bay, Wash. or from the city of Forest Grove’s watershed. None of the plywood contains urea formaldehyde, so it won’t release carcinogenic fumes. The bulk of the inventory was cut by major Oregon timber companies such as Roseburg Forest Products or Collins Companies, in forests and mills where they've committed to meet or exceed FSC standards. Some comes from small operations like family-run Zena Forest Products west of Salem. Sustainable Northwest Wood offers butcher block tables, landscape timbers and other products made from juniper, which has grown out of control in Eastern Oregon and needs to be pared back to enable environmental restoration. 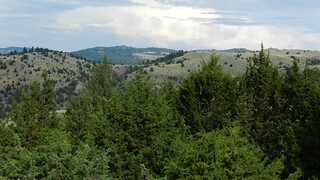 Temple is part of a concerted campaign to create a market for juniper products. The nonprofit Sustainable Northwest opened the lumber yard four and a half years ago at the peak of the Great Recession. Temple says it was quite a risk, as it’s the only exclusively green lumber yard of its kind in the country that he knows. Sustainably harvested wood generally costs about 10 percent more, he says. The five-employee business is now turning a profit, with $1.5 million in sales for 2012-13, up 25 percent from the prior fiscal year. Here's a link to the article with audio. FOSSIL, Ore. — When you walk into Kendall Derby’s mill, the first thing you notice is the smell. It’s sharp and evergreen, like the high desert after a rain. But Derby doesn’t notice the smell of juniper. "People walk in here and they say oh, I love the smell. And I don’t have a sense of smell. Born without it. Never smelled it,” he laughs. Derby runs In The Sticks sawmill on the outskirts of Fossil. It’s a mill dedicated to the bushy, short juniper tree. Juniper boards and fence posts are stacked to the ceiling in a small warehouse and thick slabs with raw bark edges lean against the wall. Beetles have carved a filigree pattern into one of the slabs. Derby says he’ll sell it as a bench or a bar top. “The target beast is one-by-six, two-by-six, six-by-six, different square lumber. But after you break a round log into square sticks you end up creating other stuff,” he says. Derby wears suspenders and as he works he’s followed around by a friend’s yellow lab. He gets excited talking about the advantages of juniper. It has a fine, tight grain. For years ranchers have used it to make fence posts because it naturally resists decay. Best of all, it’s local and sustainably harvested. Eastern Oregon has a juniper problem. Scientists say juniper have expanded their range in the high desert 10 fold since the 1870s. “They’re not a weed, they’re a native plant that expanded beyond their historic range,” explains Brent Fenty, Executive Director of the Oregon Natural Desert Association. He says settlers inadvertently helped juniper to grow by putting out range fires and introducing hungry cattle. “They’re not eating juniper, and that’s giving those juniper a competitive advantage into disturbed areas, where all those grasses are being eaten,” he says. A juniper stand near Fossil. Credit: Amelia Templeton. Fenty says small, scattered stands of juniper can provide shelter for deer and antelope and food for foraging birds, but in too many places, shrub steppe is switching into woodland. That’s a problem in a landscape that gets barely more than a foot of rainfall a year. Researchers have found that on a hot day, juniper trees with deep taproots can consume twenty-five gallons of water, although most juniper in eastern Oregon are getting by on much less. Oregon Field Guide documented some of the original juniper research on the late Doc Hatfield’s ranch in this video. The juniper’s thirst draws down streams and leaves less water for wildlife and native grasses. It’s a problem caught the eye of Martin Goebel, president of Sustainable Northwest. “It is beginning to have a real water desiccating effect in the high desert of Oregon,” he says. Goebel saw an opportunity for an environmental and economic win-win. Cutting juniper could help restore the shrub steppe grassland and create jobs. So he went to lumber wholesalers in Portland, asked them if they’d be willing to stock local, sustainable juniper. “And most of the large warehouses said, ‘Oh, too small. Eh, we don’t really know those suppliers. mmn… too nitchy,’” Goebel says. So the conservation organization opened its own for-profit warehouse in Portland, Sustainable Northwest Wood, to help people like Kendall Derby find a market for local sustainable wood. Creating that new market hasn’t been easy. Juniper trees are generally short and knotty so Goebel says the key has been developing the right products — shavings for pets, posts for signs and fences. Portland company Neil Kelly Cabinet is experimenting with fine juniper cabinetry. 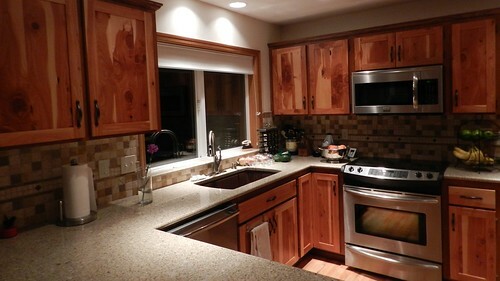 A juniper kitchen built with wood from Sustainable Northwest Wood. “It’s a challenging wood. It’s not that easy to love. It’s a tough love,” says Kendall Derby. His best customers are Portland gardeners who buy his chemical-free wood to build raised beds and planter boxes. “See, the market is still trying to figure out what can work. Production-wise, sales wise, price wise,” he says. There are supply challenges, too. Juniper often grows in remote areas with poor road access. And it can take forty or fifty stubby trees to fill up the back of a log truck. As a result, the wood is expensive to harvest and likely to remain a exotic product produced by small operations like In The Sticks, which has sold about 80 thousand board feet this year. Oregon Gov. John Kitzhaber recently created an Oregon Solutions task force for juniper, to looking for ways to build a better supply chain, and to attract investors to the market. Derby says business is still slow. He’s sunk his inheritance and his retirement savings into the mill and he isn’t making money yet. He says he feels a bit like the first person who brought a cow back to a cave and tried to milk it. But Derby is optimistic the market for juniper wood will grow. “My dream is to have four or five guys here working. That’s four or five not minimum wage jobs. In a town of four hundred people that matters,” he says. And Derby says it’s worth it, to be producing a product that doesn’t have environmental baggage attached, that helps restore the high desert landscape he loves. Behind the mill, there’s a slope he cleared of juniper a couple years ago. Now the native grasses are so thick he feels like rolling in them. On a scenic green hill in Portland, Ore., a new house represents the next generation of sustainability—and a new opportunity for architects working in the region. Called the Full Plane Passive House, the nearly 2,000-square-foot residence includes, among other sustainable features, an airtight envelope that allows the house to be heated through passive solar gain and limited reliance on an active heating source. The house also contains a significant percentage of sustainably managed wood products, sourced through a subsidiary of the nonprofit organization Sustainable Northwest. Based in Portland, Sustainable Northwest works with policymakers, builders, designers, residents, and other organizations to foster improved land management and sustainable development throughout the rural West. The organization has been active in several environmental arenas, particularly with regard to fostering collaborations across the urban-rural divide. Sustainable Northwest was actively involved, for instance, in the long and complex effort that resulted in an agreement to remove four dams from the Klamath River on the Oregon-California border. Sustainable Northwest Wood is the organization’s for-profit subsidiary, which operates as a wholesale lumberyard connecting local mills with green-building opportunities. The company fills a niche in a region that has long been at the forefront of sustainability, but faces ongoing challenges with regard to sustainable wood. Large lumber companies have asserted that limited marketplace demand for sustainably harvested wood has kept costs too high to justify third-party certification through such entities as the Forest Stewardship Council. And reports have confirmed that sustainable and locally grown certified wood products can cost up to 25 percent more than standard lumber. By increasing awareness and demand, and by promoting small eco-minded landowners and wood providers, Sustainable Northwest and its subsidiary are hoping to make the supply chain more efficient and cost-effective. To do this, the organization has been reaching out to area architects through tours, talks, and other events to help them learn how locally harvested and third-party certified wood can be incorporated into their designs. “The challenge for so many architects with FSC wood is sourcing high-quality wood that is timely and affordable at both the commercial and residential scales,” says Clark Brockman, AIA, principal for sustainability at Portland’s SERA Architects. “Without Sustainable Northwest, we had small architectural firms spending many, many hours on the phone searching for these products. Through Sustainable Northwest’s centralizing role, the industry is seeing improved quality and reduced sourcing time.” Last year, Brockman participated in a roundtable discussion hosted by Sustainable Northwest Wood on sourcing and using certified wood products. Eisenberg says that the organization wants to work with architects to broaden their knowledge of sustainably harvested wood products and building materials. Available products include pressure-treated lumber, plywood, architectural hardwood panels, and pre-primed trim, among others. “Restorative products include juniper that is harvested through grassland restoration efforts, as well as fir, cedar, and pine that are harvested during forest thinning projects like those facilitated by Sustainable Northwest,” Eisenberg says. We are the 2012 BEST Award winners for Sustainable Products! Sustainable Northwest Wood is honored to be the recipient of the 2012 BEST Award for Sustainable Products. This annual program is organized by Sustainability at Work. At the awards ceremony last Wednesday, held at The Nines in Portland, our president Ryan Temple addressed the audience and expressed his gratitude to our loyal customers, the neighbors and freinds in our community who support us, and of course the network of foresters and small mills who work hard to provide our regional green building market with high-quality, sustainably harvested wood. The best kitchen gardens employ structures -- trellises, espaliers and many other types -- to make the most of available space and to help the garden be as beautiful as it is productive. Posts for garden structures are available in many sizes and materials. Each wood used has advantages and disadvantages. My favorite posts are made of juniper, which contains aromatic oils that make the wood resist rot. Juniper is beautiful, sustainably grown in eastern Oregon and locally available. Juniper posts are available as 8-foot-long 4-by-4s and 8-foot-long 6-by-6s and are similar in price to cedar. Planks of various sizes are also available. Lengths of 10 feet or greater require a couple of weeks to get, and 2-by-6 planks are available if you want to put an overhead cap across your espalier or use them for trellises. Because of juniper's density, you'll need to pre-drill holes for screws. Driving screws directly into juniper could overheat your drill motor. * Cedar is rot-resistant but expensive. I prefer tight knot when using cedar, as it is less expensive than clear grain cedar and more stable than standard grade cedar. Sustainability is also an issue; be sure you're using Forest Stewardship Council-certified wood. Cedar is easy to drill for dowels, screws and wire. * Redwood is similar to cedar, but it's difficult to find sustainably harvested redwood. * Fir and pine are cheaper but rot. * Steel pipe is durable but looks awful and is difficult to use. * Plastic/wood fiber posts come in several colors. They are OK for edging raised beds but may bend if required to carry a load. * Posts treated with copper naphthenate or other materials resist rot, but I prefer not to use them in my organic kitchen garden. Posts such as 4-by-4s and 6-by-6s are less likely to twist, cup or bend than 2-by-4 lumber. Posts of many types of wood can be found used at recycled building supply stores or at garage sales. Use stainless steel screws to fasten juniper together. If you hide the screws with wood screw caps or mahogany dowels, use Gorilla glue to attach them. It is waterproof. If gluing juniper or another oily wood like cedar or redwood, wipe areas to be glued with acetone to dry out the oils. Seal juniper and other oily woods with Penofin for Hardwood, Exterior Formula, which was formulated for harder, denser, oily wood. An alternative for those concerned about volatile organic compounds is Timber Pro's low-VOC Deck & Fence Formula, available in clear or 25 transparent colors. Use two coats. It makes sense that in Oregon, a state known for its forests and wood products, that builders would want to work with local materials when they pick up their hammers. But until Sustainable Northwest Wood opened its doors last year, there wasn’t a good way to link builders with the small wood producers from around the Northwest who could deliver lumber that was both locally raised and sustainably produced. Now the Portland-based distributor is becoming a model for other regions of the country as a way to keep small rural businesses afloat while providing a valuable service for urban builders. And it’s not just about doing the right thing. Sustainable Northwest Wood, which was incubated at the nonprofit Sustainable Northwest before being spun off, is ahead of schedule on revenue project, despite a lackluster market for wood products. Green Hammer’s Stephen Aiguier and the Build Local Alliance were also instrumental in Sustainable Northwest Wood’s launch. The business works with 64 locally owned mills and wood products businesses around the region. Its focus is making speciality wood — varieties like juniper, white oak and madrone — available to Portland builders. Temple places orders that these suppliers can process when the mill would otherwise be idle. He advises them on everything from what will sell to how much to charge for it. “Our success as a distribution yard is wholly dependent on the success of the small forest suppliers,” Temple said. A lean operation, Sustainable Northwest Wood has three employees and contracts with other Portland businesses to custom finish wood as needed. Its June to July fiscal year closed out 2011 with $750,000 in sales. Temple expects that to nearly double to $1.2 million in the current fiscal year. Green building has been a bright spot in what has otherwise been a pretty lousy year for the building industry, a development that hasn’t gone unnoticed. Temple frequently fields calls from the old guard of the lumber sector, asking how Sustainable Northwest Wood is able to source 100 percent of its inventory in wood certified by the Forest Stewardship Council. Innovations in the green building supply chain will spread quickly once word gets out that there’s money to be made. The Nature Conservancy, a smart, nonprofit, ecosystem-saving organization, owns and manages the 7,600-acre Ellsworth Creek Preserve in Washington. The preserve connects to the equal-size Willapa National Wildlife Refuge, home to seabirds such as brown pelicans, the marbled murrelet, wintering Pacific brant, head-bobbing shorebirds that poke for food in the mudflats, and countless critters that live in the rich mosaic of salt- and freshwater marshes. Nearly pristine Willapa Bay is world famous for oysters and runs with chum, chinook and coho headed up-creek to spawn. The combined protected areas host bear, elk, cougar, flying squirrels, bats and their wild associates. Bald eagles patrol the skies; Pacific tree frogs chirp in the underbrush. As The Nature Conservancy (TNC) says, Ellsworth Creek is all about "thinking big." All but 300 acres of the preserve have been logged over, high-graded, degraded and abused. TNC has developed a restoration plan, thinking long-term and letting nature do much of the regrowing and repair. Over the next century, loggers under TNC's direction will carefully thin parts of this coastal rainforest, extract any non-native trees and restore the forest's natural productivity and diversity. The wood that has been thinned from the preserve is sold to discerning brokers such as Sustainable Northwest Wood -- and the profits provide revenue for the restoration work. Streams are being rehabilitated, and the patches of old growth are safeguarded. Some trees are centuries old, already towering adults before any Europeans passed through the area. The preserve's recovery and management plan has been certified by the Forest Stewardship Council (FSC). By following the FSC guidelines, managers can take commercial quantities of wood from a forest without compromising its ecological integrity. In fact, TNC is showing that commercial logging can even help restore a forest. Biologist Tom Kollasch, Willapa Program Director for TNC, hopes that the project will provide a blueprint that can be used to restore other forests around the world, and in this article explains how selectively logging trees in old-growth forests can actually help revive marbled murrelets, a threatened seabird. TNC is no stranger to radical restorations and has used logging, fire, cattle and other blunt instruments to recover ecosystems across the country. Ellsworth Creek is the first TNC holding in the West to earn FSC certification. We're delighted to be among the first buyers of the certified wood from the preserve. It's beautiful cedar and carries a motivating tale of successful conservation. We love standing on our cedar deck and thinking of its connection to marbled murrelets, cougars and elk. The long debate over how to manage our forests has often been divisive, but amid the discord there are some dazzling displays of collaboration. It's indeed possible for timber cutters, conservationists and businesspeople to all paddle in the same direction. A local, nonprofit organization called Sustainable Northwest brings these diverse forces together in a program called Healthy Forests, Healthy Communities Partnership. Sustainable Northwest is led by the charismatic and clear-thinking Martin Goebel, who published a proposal in the Oregonian last week aiming to recast the entire argument over how to save salmon. The iconic fish, properly managed and productive forests and thriving rural communities are all linked, Goebel wrote, and profit incentives will work better than regulations in unlocking creative solutions and a lasting determination to work together. Much of the wood in our Beavercreek eco-home/office - still under construction - comes from Healthy Forests managed by Healthy Communities through Sustainable Northwest Wood, Inc. in Portland. SNW is perhaps the only lumber yard in the country that deals exclusively in wood from forests certified as responsibly managed. Buying wood through SNW is like ordering seafood from so many responsible Portland restaurants – you know it's sustainably harvested or it wouldn't be on the menu. With the guidance of SNW manager Ryan Temple, we chose bigleaf maple for two floors. This spectacular, warmly pale hardwood grows in combination with Douglas fir and is still quite common. Our floors came from local, sustainably managed forests. Our window trim is Doug fir from Hyla Woods, located about an hour west of Portland. This family-owned business manages three forests certified by the Forest Stewardship Council. The goal and mantra of Hyla Woods is "to grow ecologically complex, economically viable, responsibly operated forests." The model forests host students and researchers. Every year, the foresters select a few trees for felling. The logs are milled in the forest and dried in a solar kiln. Jim & Chip Aug2011.jpgView full sizeCM WilleMaster carpenter Jim Cochell at work, with enthusiastic encouragement from Chip the Dog. We instantly had a soft spot for the operation as Hyla is the Latin name for a large and diverse genus of frogs – the gaudy green and red tree frog – also the logo of our organization, the Rainforest Alliance. We're fortunate to be able to surround ourselves with fabulous woods harvested and milled by caring and skilled woodsmen and women. The sustainable wood market creates sustainable jobs and, yes, healthy communities. As these partnerships grow and branch out, they are attracting high-level attention. Recently, President Obama's top environmental policy adviser visited a Healthy Forest collaboration in John Day, a timber-dependent town in south central Oregon sandwiched between two national forests. Window frame.JPGView full sizeCM WilleForest Stewardship Council certified window trim and flooring. According to Sustainable Northwest, which coordinated the visit, Nancy Sutley, chair of the White House Council on Environmental Quality, said, "As we look at models for conservation, the top-down models of the past don't necessarily meet the needs of today." Sustainable Northwest and collaborating logging communities get praise from the White House; we get beautiful wood in our house. Thank you, Kelley Beamer and the folks at Cascadia Region Green Building Council, for sharing this important information! Each time a new building is designed, constructed or renovated, builders have an opportunity to support healthy and resilient forests by choosing sustainably harvested wood products. Thanks largely to growth in the green building sector and the uptake of Leadership in Energy and Environmental Design — LEED — building certification, several forestry standards have entered the market. The most rigorous standard was developed by the nonprofit Forest Stewardship Council. The organization, known as the FSC, promotes responsible management of the world’s forests. FSC certification is a voluntary, market-based tool that ensures the highest biological and ethical standards were followed from forest to mill. FSC contains more performance-based criteria than any other standard in North America and follows strict requirements for assessing and conserving old growth and biodiversity. The standard is also dedicated to protecting the rights of indigenous peoples on public and private lands and is the only certification system that outright prohibits genetically modified organisms. When lined up to other forestry standards, the FSC certification holds the highest bar. In Oregon, we have several FSC-certified forests that represent both family-owned forests and large-scale land, like the FSC forest managed by the Warm Springs Tribe. As of March 2011, there were 548,379 acres of certified forests in Oregon. These forests provide an alternative to industrial timber harvesting, which have caused soil erosion and landslides that damage habitat and drinking water. To date, the key problem has been linking these local forest products to the local builders who can source them. The good news is that the opportunity is growing. Sustainable Northwest Wood is filling the critical role of connecting customers to wood sourced from sustainably managed forests and family owned mills in the Pacific Northwest. Just as farmers’ markets connect people to the farmers that grow their food, Sustainable NW Wood connects builders to foresters. The organization operates a warehouse in Southeast Portland that provides builders with immediate delivery of specific wood orders. Each wood order carries with it a story about its place of origin. The premium of FSC wood varies, but in many cases Sustainable Northwest Wood is finding that they can supply at costs comparable to non-certified wood. The building community has a major role to play with ensuring the future of our forests by building with certified sustainable forest products that address the triple bottom line of people, planet and prosperity. FSC products provide a value added product that can put Oregon in a leadership position for sourcing local wood and protect the long-term health of our local communities.